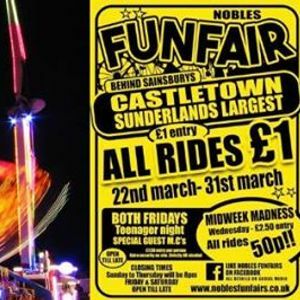 Nobles Funfairs present our Mega £1 Funfair behind Sainsbury's in Castletown, Sunderland from Friday 22nd until the 31st of March. With rides to suit all ages it's guaranteed to be a fantastic day out for the whole family and at just £1 per ride it's not going to break the bank either. On Friday 22nd and Friday 29th of March it's Teenager night with special guest M.C's £1.50 entry per person. Extra Security on Site. Strictly NO ALCOHOL! Open til Late. Friday & Saturday Open til Late. Make sure to like the Nobles Funfairs Facebook page to keep up to date with everything that's going on. Times stated on this Facebook event page are guides only. Weather permitting for all rides. Make sure to enter the competition and give the main page a like too on Nobles Funfairs.